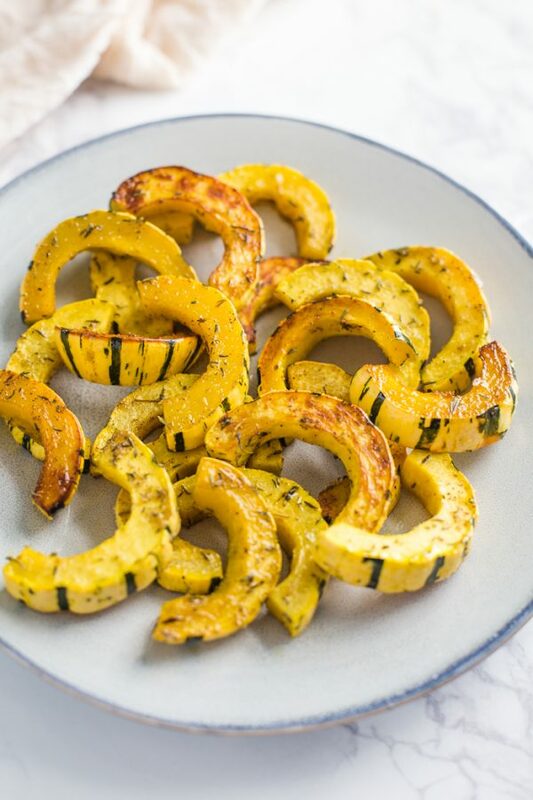 Have you ever had delicata squash? It’s one of those foods that is highly under-rated. It’s SO good and ridiculously easy to make. The skin is thin and much softer than the skin of a butternut squash or acorn squash so you can just leave the skin on and eat it whole. That makes the cooking process a lot easier which I’m a fan of! 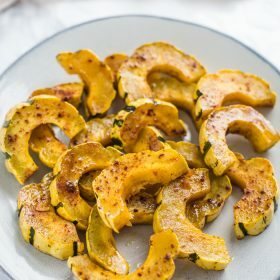 Today I’m giving you TWO different options for roasting your delicata squash: a sweet delicata squash recipe and a savory delicata squash recipe. 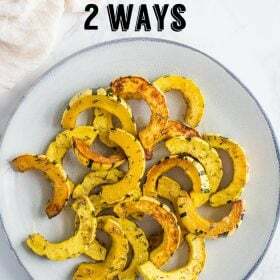 Each one of the recipes below calls for 2 delicata squash BUT you could cut each recipe in half and make some of the savory AND some of the sweet. I high recommend that! 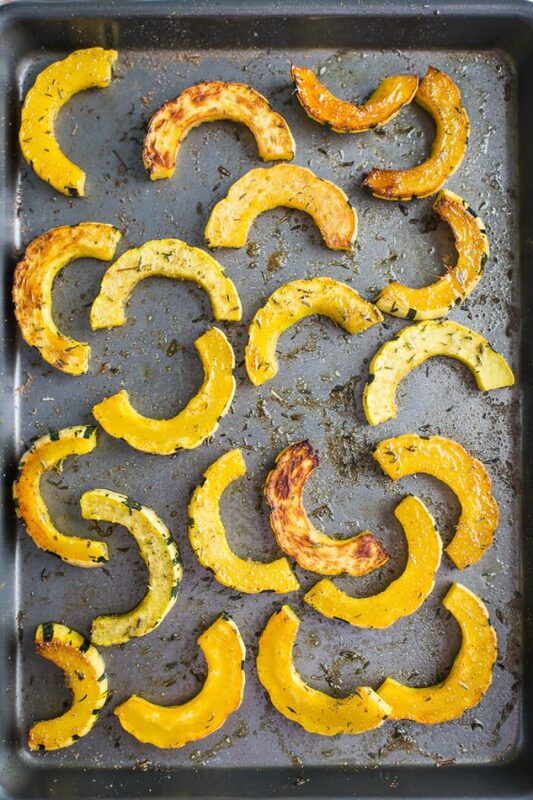 Delicata Squash is MAYBE the easiest of squashes to roast. 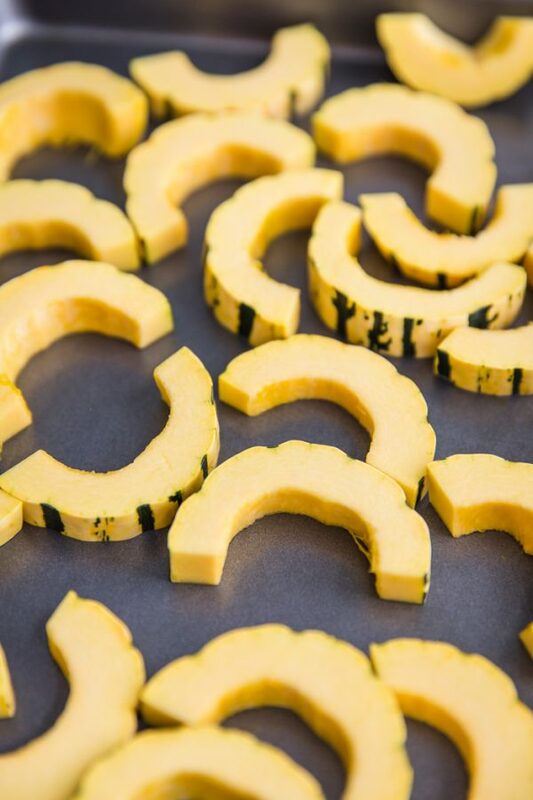 The only prep work required is simply cutting the squash in half and then slicing it into half moons. ALTHOUGH, you could also just leave them in rings if you so desired. There’s just something about the half moons that I really like. 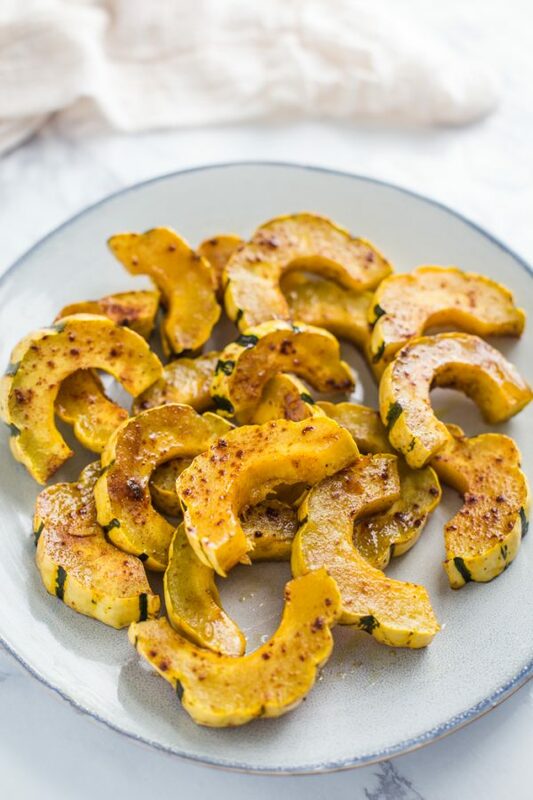 For the herb roasted delicata squash, you’ll toss the squash in olive oil, rosemary, sage, garlic powder, and salt + pepper. I toss everything right on the baking sheet in order to avoid washing any more dishes than necessary! 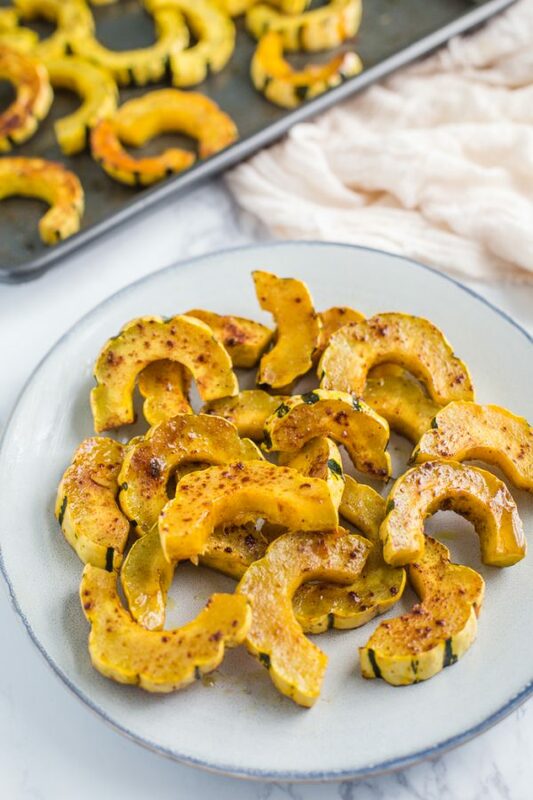 For the sweet cinnamon roasted delicata squash, you’ll toss the squash in maple syrup, brown sugar, cinnamon, and a little pinch of salt. We’e keeping it nice and brief today. I’m off to test pumpkin recipes for PUMPKIN WEEK coming up in a couple weeks. Get very excited!! Pre-heat the oven to 400 degree F.
Slice the stem and the bottom off of the squash and discard. Leaving the skin on, cut the squash in half long ways and then slice half moon pieces that are roughly 1/2 inch thick. Place the squash on a large baking tray. Toss the squash with the remaining ingredients from EITHER the herb recipe or the sweet recipe. Toss until combined and then spread the squash out evenly on the tray. Bake for 15 minutes, flipping the pieces over after about 8 minutes.